The Soloution-IV CreditCard Processing module is an integrated solution to processing and validating credit card and debit card payments through your accounting system. Thoroughbred® has teamed up with Heartland Payment Systems one of the leaders in credit card processing, to provide Solution-IV users a seamless transaction gateway. 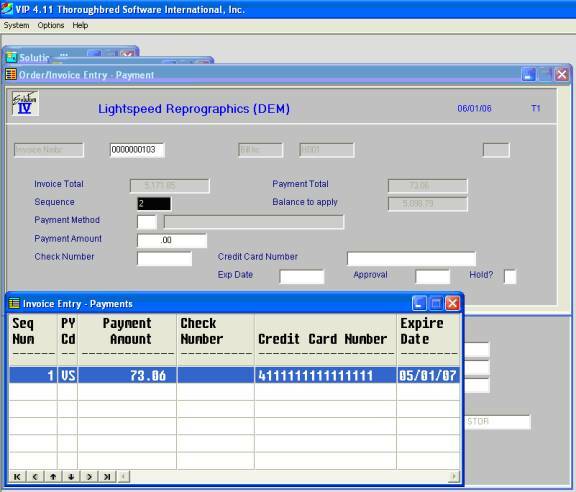 Eliminate entering credit card information by hand and reduce card information errors, charge-backs and fraud. Receive a better discount rate from Heartland Payment Systems by swiping your customer credit cards and capturing all magnetic stripe information. The Heartland Payment system comes standard with a credit card transaction Web interface, which gives immediate results of all card transactions processed as well as daily financial reports to reconcile your merchant account. All the software and hardware is provided with the system to get you started, quickly and easily. Call Thoroughbred for more information on the Solution-IV CreditCard Processing, and start enjoying the benefits today.